From administrative and reception duties to patient care, dental assistants have a range of responsibilities at the clinic. Aside from oral treatments and procedures such as dental bonding, bridges, implants, and more, there are specific sets of skills you need to learn in order to become an effective and efficient dental assistant and thrive in the health industry. Formal education is not needed for working as a dental assistant. There are dental assistants in the field with a high school diploma and on-the-job training. However, there are degree programs and certificates available in this field that provide a more elaborate and comprehensive career education. These programs typically last one to two years, focusing on technical education through classroom and clinical instructions. There are vocational schools and community colleges that have a two-year associate’s degree dental assisting programs that combine general education and technical training on procedures such as tooth extraction, root canal, dental bonding, and more. Additionally, some states require the necessary certification or license before working as a dental assistant. The U.S. Bureau of Labor Statistics has projected an 18% increase of employment for dental assistants until 2024. They added that an annual median salary for the dental assistant position in 2018 is $36,458. If you’re deciding a profession as a dental assistant, consider the required training, job duties, and job growth. First and foremost, make sure to check your state’s license and certification regulations. Before you take on a dental assisting education program, take a look at these seven skills you need to develop. All dental professionals must know how to be effective communicators. Since dental assistants spend a lot of time interacting with fellow staff members, patients, visitors, and vendors, communication lines must always be open and transparent. 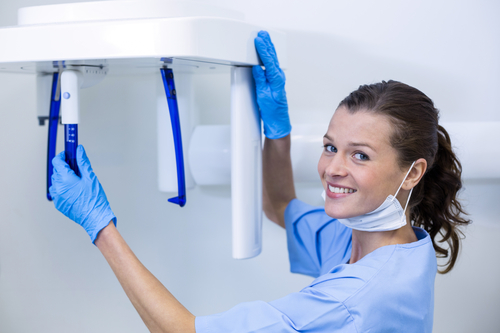 All oral health procedures including dental surgery, dental bonding, filling, tooth extraction, and more, require meticulous cleaning and sterilization of all equipment, tools, and work area. Dental assistants must learn how to assist in carrying out a procedure or treatment properly. Another responsibility of dental assistants is to ensure the organization and cleanliness of the office. From scheduling appointments to answering phone calls, social media engagement to other administration and marketing duties, dental assisting is a well-rounded position. Anyone working in the health industry should know how to apply first aid correctly – and dental assistants are no exception. An excellent dental assistant must possess necessary life support skills and how efficiently perform them. As a dental assistant, you are the critical bridge and important link between the dentist and his or her client. Therefore, a dental assistant must be professional at all times. The patients’ comfort is one of the main considerations when dental assisting. Moreover, accurately checking medical history and using non-verbal communication with the dentist during a procedure, so the patient is calm and comfortable are signs of a useful dental assistant. You will learn all these skills and more during your training and hands-on learning. I have been a family dentist in Phoenix, Arizona for over two decades. Arizona is my home, and I would never want to leave here for the world. I'm happily married to the dazzling Karen with two bustling boys. I love the Bee Gees, so I just had to pick up this domain! On this blog, I will be offering the best of my wisdom to you about dentistry and the benefits of quality family dental care. 2018.10.23For Excellent Well-BeingWhy Does My Jaw Hurt?